OM Relax capsules 100 pcs. 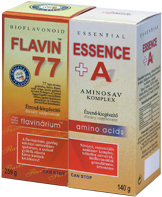 A complex of granulate and grist of vegetal essential amino acids, unsaturated fatty acids and bioflavonoids. Composition: hempseed, red grape-stone and skin, broccoli, garlic, coriander granulate and grist, plus Ester-vitamin C, vitamin B2 , B6, Adenine, biotin, malic acid, ALA (Alpha-lipoic Acid), ALC ( Acetyl L-Carotine). The preparation and everyday use offers opportunity to utilize two more inventions and products with great experiences. 2. Emulsion: a liquid constituting a permanent medium and in it another finely scattered (dispergated) liquid or system of liquids scattered in tiny sprays. Its components do not intermix with each other, or they do it just partly, therefore they separate from each other while stagnating, however this separation can be inhibited using certain surface-active substances. The use of emulsions has got several advantages: among others they facilitate admission of liposoluble active ingredients , while ensuring smooth dispersion of the components. 3. Amino acids are outstandingly significant for the world of living beings, as they are the building stones of protein molecules. 25 kinds of amino acids are found in the human body, 20 among them belong to the protein-basing ones, and the remaining 9 however are vitally important (essential ones). Using a combined, natural amino acid complex, then mixing it with in a portion of the coction, its efficiency can be further enhanced. Recommended use: 20 g/day, 2 teaspoonfuls of the content of box to take, eat it directly or mix it with some other drink. FLAVIN 77 can be added to a coction this way, too! Consumption of the content of box is recommended for a week (20 g daily, 1 tablespoonful or 2 teaspoonfuls).